Guayaki Canned Yerba Mate Teas are an all natural, organic, and kosher made by Guayaki Beverages. Their products are rain forest friendly and a percentage of all sales goes to saving rain forests. All of these flavors have the same caffeine content. 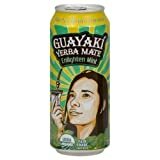 Guayaki Canned Yerba Mate isn't suitable for children because of the high caffeine content of yerba mate. 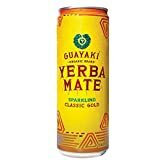 Guayaki Yerba Mate Classic Gold Sparkling Mate, 12 Fluid Ounce - 12 per case. Guayaki uses all organic ingredients. Sugar content: 26 grams (per 16 ounces). 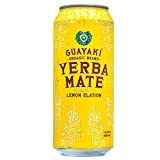 How Does Guayaki Canned Yerba Mate Compare? 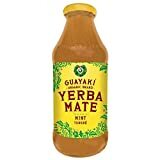 Guayaki Canned Yerba Mate contains 9.38 mgs of caffeine per fluid ounce (31.70mg/100 ml).